THE SCOOP: Ranch Foods Direct is now providing a delivery and distribution point for Hi Plains Dairy, a goat and cow dairy located on the eastern plains that offers goat or cow shares in exchange for convenient weekly deliveries of farm-fresh milk. Everything is bottled to the highest Grade A standards. 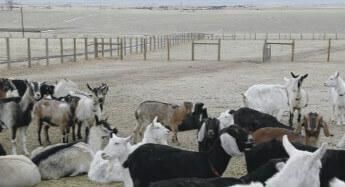 THE BACKSTORY: Jim and Angela Smith started the dairy in 2003 with several breeds of goats. Last year, they added Jersey cows. The operation is a labor of love for them both. Jim is a former cabinetmaker and professional body builder. Angela grew up visiting her grandfather’s 75-cow dairy near Platteville and was a one-time Greeley Stampede rodeo queen. She is also a registered nurse. UP NEXT: The Smiths are eager to expand their offerings by making yogurt and cheese as well as jams and jellies. Located about 35 minutes straight east of Colorado Springs near Calhan, they also look forward to engaging the public about the importance of healthy food and farming. “We want to invite kids out and do tours. I think that’s where we’re going to make the biggest difference,” Angela says.